Whether red as a beet or white as a sheet, humans often reveal emotions through complexion, but hair and skin color are purely genetic. When it comes to the color of marine critters, hue variation may be due to genetics. But for some, diet makes for individual variety. Brooding anemones (Epiactis prolifera) tiny (a half-inch in diameter) flower animals display a natural color variation from tangerine to red, but sea slugs (nudibranchs), predators that prey on brooding anemones, absorb an anemone’s pigment. 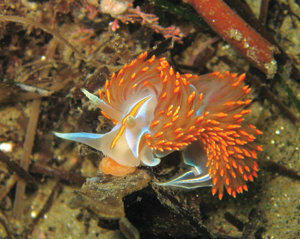 For some time now, the La Jolla Ecological Reserve has been inundated with brooding anemones. 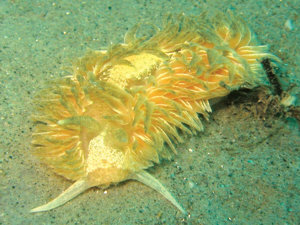 They are everywhere, their bright color polka-dotting substrates from algae, rocks and even the shells of some animals. Many slug species rarely seen here have been popping up, maybe in part due to the bumper crop of E. prolifera. What I find especially interesting is capturing nudibranchs in the midst of chomping an anemone snack and noting the color shifts of familiar and unusual sea slugs due to diet. 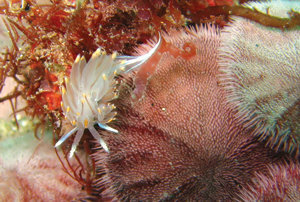 Examples here show brooding anemones and the nudibranchs Hermissenda crassicornis and Aeolidia papillosa, displaying permanent (genetic) color or temporary (diet).